The importance of staying fit cannot be overemphasized, but if you have ever tried sticking to an exercise regimen, or attempted to keep a close lookout at your calorie intake and spending, you know that it can be a tricky task that requires a lot of devotion, sacrifice and planning. Luckily, now there are a great number of apps for Android that can help you with this in a number of different ways. Find the right app, and you might get almost all the benefits of hiring a personal trainer or a nutritionist at a significantly lower cost, or for no money at all. 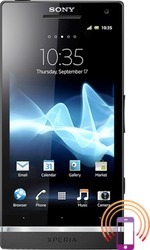 All you need is new android phone, Sony Xperia S is great solution. This is a great app for people who like exercising at home and don’t necessarily have a lot of exercising equipment. This makes it ideal for people who are just considering starting exercising, as apart from being all that you need to start working out, it gives you video instructions on how to do certain exercises, and tells you what muscle groups will be affected. Apart from providing you with exercise ideas and the correct way of doing each exercise, it also lets you save your workout programs, use one of the preprogrammed plans and share your progress with your friends. Running has long been accepted as one of the best ways to lose calories and stay fit, and this app will let you get the most out of the experience. Basically it provides you with all the data that you would be getting on a treadmill, and not keeping you confined to the gym or your room. While you are running, the app keeps track of the calories you are losing, the speed at which you are running, your heart rate and the time that you have spent running. Another great thing about it is that it has the auto-pause option which will recognize when you have stopped and pause the time, giving you a more accurate assessment of your workout. As you know, staying fit is not only about the calories you spend, but also the calories that you take in. This is where this app comes in. Once you install it, it will ask for some of your data, including your weight, height and gender, after which it will require you to provide your goals regarding your weight, which is to say whether you want to gain, lose or maintain weight. Once you have done that it will continue monitoring your calories intake and your weight on daily bases, and calculate the modifications that you need to make to your calorie intake if you want to meet your goals. As most apps of this type, this one also comes with a barcode scanner that makes entering data on the food you are consuming much more convenient, and helps you when shopping for food. While exercise is healthy, you shouldn’t get carried away and overdo it. This app gives you a quick and simple way to instantly measure your heart rate and have a rest if you do determined that you have been getting carried away. It is able to do this just by using the phone’s camera to observe your fingertip and the way it changes color.